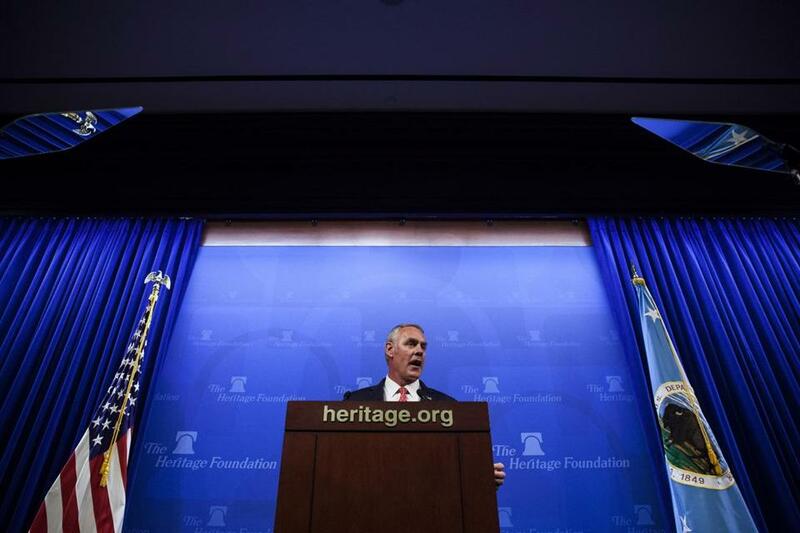 Interior Secretary Ryan Zinke spoke at the Heritage Foundation in Washington, D.C., in September. At right is his special secretarial flag. WASHINGTON — At the Interior Department’s headquarters in downtown Washington, D.C., Secretary Ryan Zinke has revived an arcane military ritual that no one can remember ever happening in the federal government. A security staffer takes the elevator to the seventh floor, climbs the stairs to the roof and hoists a special secretarial flag whenever Zinke enters the building. When the secretary goes home for the day or travels, the flag — a blue banner emblazoned with the agency’s bison seal flanked by seven white stars representing the Interior bureaus — comes down. In Zinke’s absence, the ritual is repeated to raise an equally obscure flag for Deputy Secretary David Bernhardt. ‘‘Ryan Zinke is proud and honored to lead the Department of the Interior, and is restoring honor and tradition to the department, whether it’s flying the flag when he is in garrison or restoring traditional access to public lands,’’ press secretary Heather Swift said in an email. Zinke, a Stetson-wearing former Montana congressman who has cultivated an image as a rugged outdoorsman, has come under a harsh spotlight in recent weeks for behavior criticized as extravagant for a public official. The agency’s inspector general opened an investigation after he ran up bills for travel on chartered jets and mixed business with political appearances, sometimes accompanied by his wife, Lola. It’s one of five probes underway of Cabinet secretaries’ travel. Zinke upset some of the 70,000 employees at the agency that manages public lands by stating that 30 percent of the workers are ‘‘not loyal to the flag’’ in a speech to oil and gas executives. It is unclear whether the reference was literal or figurative. Zinke rode to work on horseback on his first day in office and displays animal heads on his wood-paneled office walls. For a while, he kept a glass-case display of hunting knives but was asked to remove them because of security risks, according to people familiar with the decision. He has commissioned commemorative coins with his name on them to give to staff and visitors, but the cost to taxpayers is unclear. Zinke’s predecessors and some other Cabinet secretaries have coins bearing agency seals, but not personalized ones. The flag ritual is unique in President Donald Trump’s administration. The White House does not raise the presidential flag when Trump alights at 1600 Pennsylvania Ave. There is no Defense secretary’s flag atop the Pentagon. Secretary of State Rex Tillerson, like his predecessors, has a personal flag that flies beside the U.S. flag in front of the department’s Foggy Bottom headquarters. But it’s there whether Tillerson is in the building or not. ‘‘We’re talking about Cabinet members and federal buildings, not the Queen of England and Buckingham Place,’’ said Chris Lu, deputy Labor secretary in the Barack Obama administration, referring to the British tradition of announcing the queen’s presence by raising her personal heraldic flag. ‘‘If we had a secretarial flag at the Obama Labor Department, we never bothered to locate it or use it,’’ Lu said. Retired Army Col. Steven Warren, who ran the Pentagon’s press operation before retiring this year, could not recall the place in Washington hierarchy represented by the raising of a federal official’s personal flag. Personal flags for federal government officials have a proud, if arcane, history that originated with the secretary of the Navy in 1866, to help sailing ships in the fleet recognize which one carried the naval commander. The Coast Guard and secretary of war wanted one, too. By the early 20th century, the civilian heads of the Treasury, Commerce and Labor departments had flags. The first one for Interior was adopted in 1917. ‘‘If you were the secretary of agriculture, you asked yourself, ‘Hey, the secretary of war has a flag, how come I don’t have one?’ ‘‘ said Joseph McMillan, a retired Defense Department official and student of flag history from Alexandria, Virginia, who is president of the American Heraldry Society. The flags proliferated by World War Two, with banners for subordinate officials from undersecretaries to assistant attorneys general. Back when security was not a concern, official government vehicles would display a high-ranking official’s personal flag on its left front fender, with the American flag flanking the right. They were considered pretentious, McMillan said, and eventually went out of fashion. At Lady Liberty Flag and Flagpole in Austin, Texas, one of the largest flag vendors for federal offices, Sandra Dee Merritt said she sells 300 to 500 department flags a year to various Interior offices. Secretarial flags are no longer in demand. ‘‘I haven’t sold any of those individual secretarial flags to any agency in forever,’’ Merritt said. Raising a personal flag to mark an official’s presence remains a custom in the military. Field commanders often display their unit’s flag when they are at headquarters to signify that the boss is in. But the personal flag, whether belonging to a general or a Cabinet secretary, stays behind the desk, if it’s there at all. By flying his flag, Zinke is doing exactly what the flag was designed for, McMillan said. Yet he’s skeptical. The Interior Department is not the Navy.